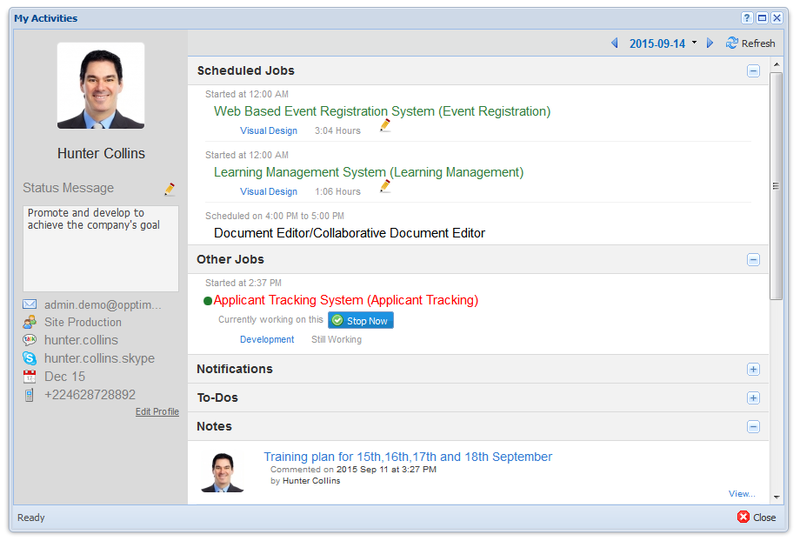 This option helps OPPTIMO users to manage their activities, scheduled jobs, To-Dos, other jobs and notes. “My Activities” option is available for all types of users. Step 1: Click on -> Click on option in “My Activities” window. Step 2: Select [Job], [Task] and type any comments about the job in “Add a Job” window. Step 3: Click on button to save record OR click on button to exit. Once you click on button, you can see the added job under “Other Jobs” category in “My Activities” window. Step 2: Enter number of worked hours and any comments regarding task/ job in “End Task” window. Step 1: Click on -> Select the date from navigation keys -> Click on option in “My Activities” window. Step 2: Enter job details you worked in “Add a Job” window. Users can view all scheduled jobs form “Scheduled Jobs” category in “My Activities” window. Job scheduling can be done by Manager and Admin type users only. Step 1: Click on -> Click on option. Step 2: Select [Task] from the dropdown list and type any comments, if you need to enter in below “Add a Job” window. Step 1: Click on -> Click on current working task. Step 2: Select the task from the drop-down list in “Change Task” window. Step 1: Click on -> Click on “Delete” icon of the job you need to delete. Step 2: Click “OK” button in the “Confirm” pop-up box to verify your action. Purpose Adding comments provides yourself and others information about the work done in a particular job. Good commenting behaviors will always increase the overall productivity of your team and visibility of the job as you do not have to go back and figure out what has done/ what has modified etc. You can simply read comments. 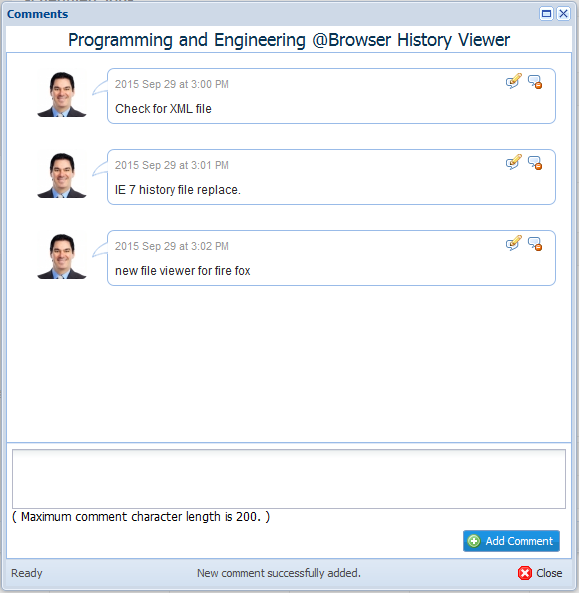 Step 1: Click on -> Click on “Add Comment” icon of the job you need to comment. Step 2: Type the comment in below “Comments” window. Step 1: Click on “Edit Comment” icon of the comment you need to modify. Step 2: Edit necessary information in “Edit Task Comment” window. Step 1: Click on “Delete” icon of the comment you need to remove. Step 2: Click “OK” button in “Confirm” pop-up box to verify your action. Step 1: Click on -> Select the job/ task you need to edit time. -> Click on “Change the time that you worked” icon. Step 2: Edit the time in below prompt window. Step 3: Click on “Save” button to save the changes. Step 1: Click on “Click to edit status message” icon in the box. Step 2: Enter the status you need. Step 3: Click anywhere out of status box to save the record. Click on option to edit user profile details. This will navigate you to “Edit Your Profile Details” window. For more information on how to edit you profile, refer “My Account” section of this manual.